Trying to find a place to stay in Plano for several weeks or months can be difficult. While there are many apartment buildings, trying to secure a short-term lease can be a hassle and quite expensive. Instead of having to go through the entire process of leasing an apartment, stay with us at Studio 6. We are one of Plano’s finest extended-stay hotels. Conveniently located close to three universities, many shops and eateries, and the Plano Medical Center, Studio 6 is a great way to enjoy the benefits of Plano without breaking the bank or having to go through the process of leasing an apartment. Call us today to find out how we can make your long-term stay easier and more comfortable. Leasing an apartment or home can be great if you know you’re going to stay in an area for at least six months or a year. 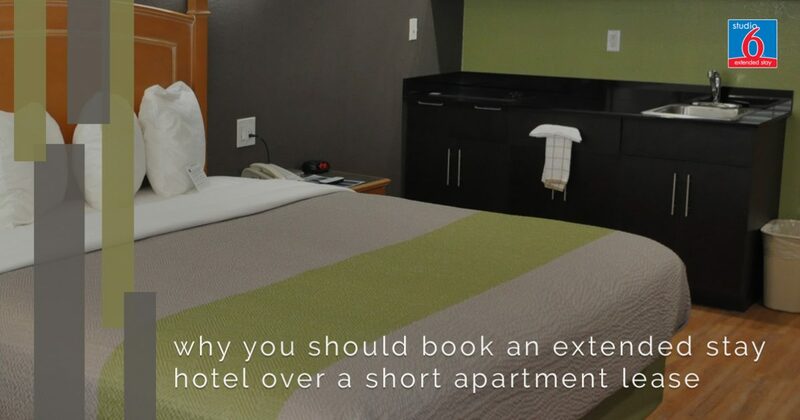 However, if you need to stay for a period of time that is longer than a typical vacation yet shorter than a typical lease, it can be hard to find something that works for you. This is especially true if you have less than perfect credit. When you fill out a lease application, it is standard procedure for most apartment buildings and rental agencies to check your credit. Depending on your score, they may not rent to you or they may require a larger deposit. If you’re on a tight budget this probably won’t work for you. At Studio 6, we don’t check your credit and our rates are flexible enough to allow you to shorten or lengthen the amount of time you spend with us while still being an affordable option. Studio 6 was designed to give you the feel of a home instead of a hotel. Each unit has a full kitchen and enough space for you to be able to stretch out and get comfortable. So you get all of the features of an apartment without all of the extra time and money it takes to secure one. You can unpack all of your clothes and organize the entire room so it feels like home. You can even bring your pets with you to Studio 6, which a lot of apartments don’t allow. Nothing makes a place feel like home quite like the love and companionship of your dog or cat. Another added bonus of staying with us is that you can let someone else take care of cleaning the floors and bedding. This is especially helpful when you’re out applying for new positions, going to interviews, or hanging out with your family. If you’re coming to Plano for a long visit of undetermined length, stay with us. We’re close to everything and we make it easy to feel like you’re home when you’re here. Contact us today to find out about our low rates and to ask any other questions you might have about our extended-stay hotel or the area. We hope to see you soon!